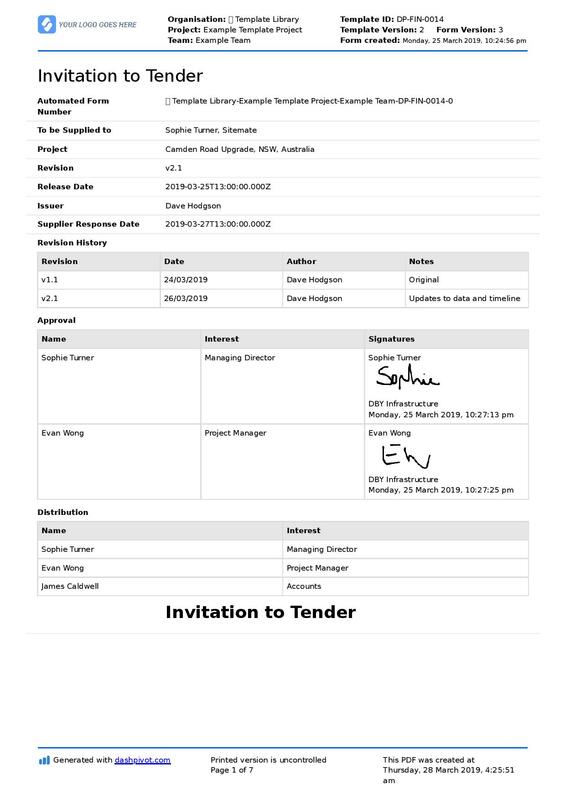 Tender documents for construction are some of the most important documents which construction companies and project and asset owners deal with because they dictate who is going to be delivering what projects - which has a direct impact on all of the companies working on a project as well as the project of course. 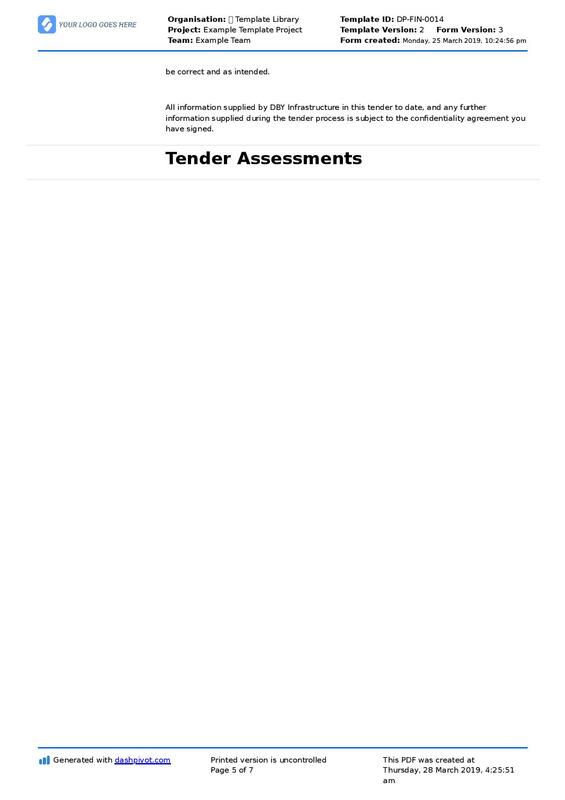 Construction tender documents include the documents which project and asset owners use to invite vendors to bid on their projects, and the documents which vendors (contractors, subcontractors, suppliers) use to submit their tenders or put their hand up to work on the project. In general, tendering refers to the suppliers required to complete construction works - but tender documents have become synonymous with the process of inviting, bidding and selecting services. In the construction industry, where everything is project based, tenders are the main mechanism by which companies choose who to work with, and these documents span across most of the types of vendors including general contractors, equipment suppliers and enabling works. So for all companies operating in construction, tendering documents serve a vital role in the success of their business. Preparing tender documents can be a project in itself for construction companies, and reconciling and making procurement decisions can be quite the effort for asset owners and operators as well. The best way to prepare and handle tender documents is to break them down into packages. Each package should be for a specific area, phase of piece of work or product, so that the parties submitting tender documents can prepare accurate bids. Breaking down your tender documents effectively also enables the party receiving the package and selecting the vendors to more easily sort the vendors into groups, assess them properly, and make better and more informed decisions. As you can see, the tendering process is pretty comprehensive in construction, and can start to eat into the project preparation and specification stage. This is great for clarity around the project, but means that construction companies can spend a lot of time on tenders which they may not win (but you do have to be in it to win it). Out of these tender documents, the most comprehensive is usually the form of tender or tender submission and the part that the construction companies are most concerned with getting right and formatting correctly. As is the case with most documents in the construction industry, tender submissions can vary quite dramatically from company to company and project to project. But there is some better frameworks than others, and some general inclusions which most companies are going to want to include. 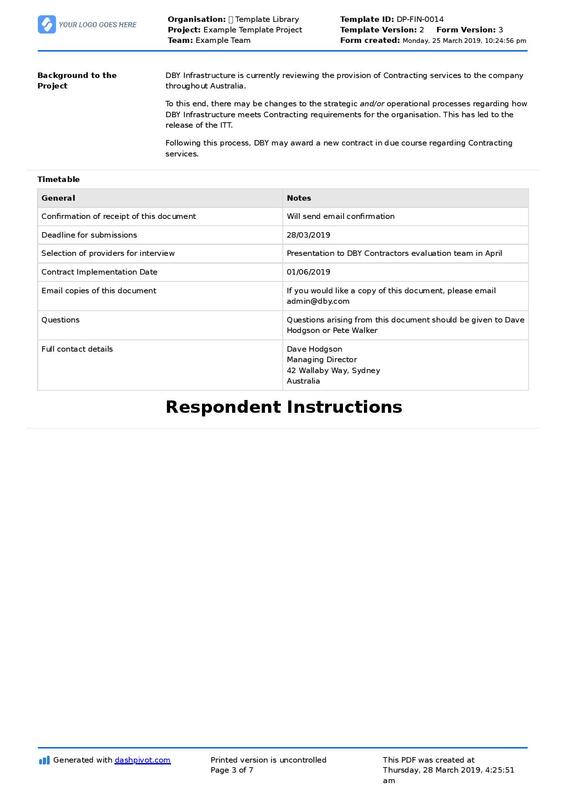 The construction tender document example below obviously isn't in its PDF or document form, but it gives you a good idea of the contents which will be included in tender documents for construction. 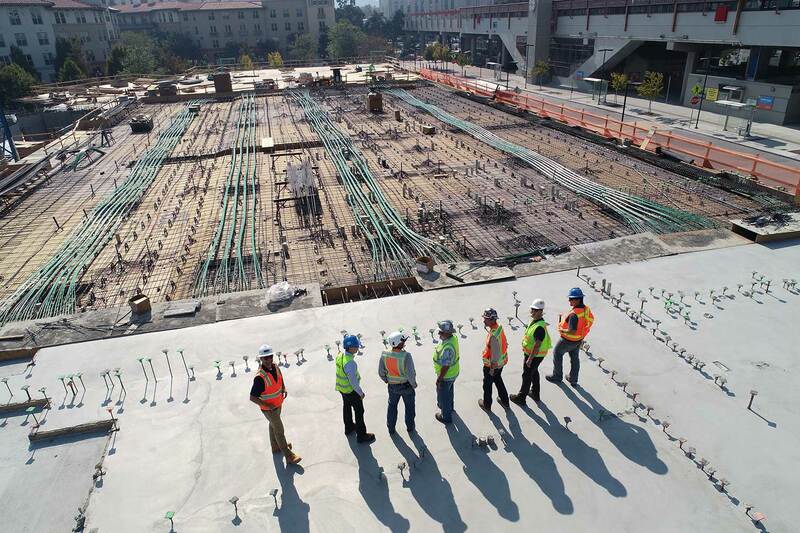 Some of these items are established and completed by the project or asset owners, while others are completed by the contractor, subcontractor, supplier or other bidding party. A tender submission will also frequently include a tender document cover letter, but that is usually quite simple, with some company identification pieces and some info regarding the project name and number. So now that you have seen that example of a tender document, how are these tender documents usually presented and shared between parties? The most common format for tender documents in construction is unsurprisingly the PDF. 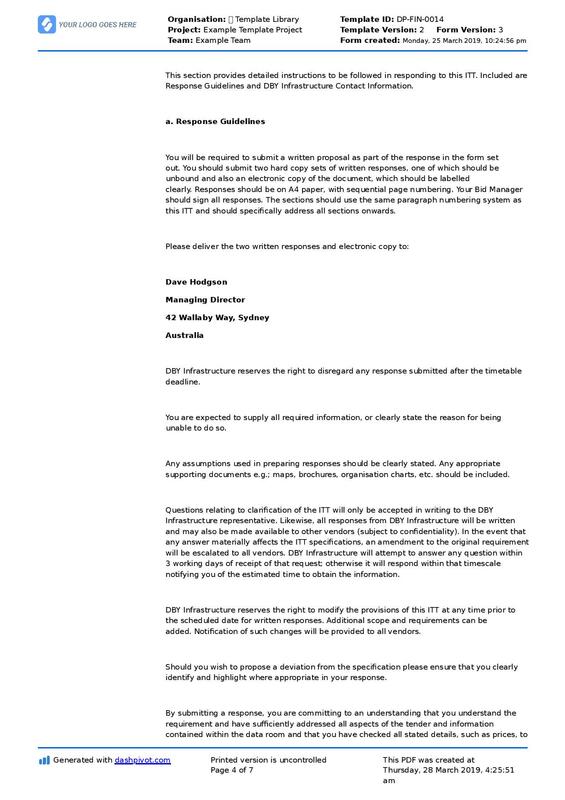 The tender document below is a good example of what one of these PDF forms may look like. The document includes some nice formatting, a clear structure, and provides a platform from which the parties can collaborate on tender documents. How are these tender documents sent and shared? Mostly via email, with some companies still sending supplemental letters. 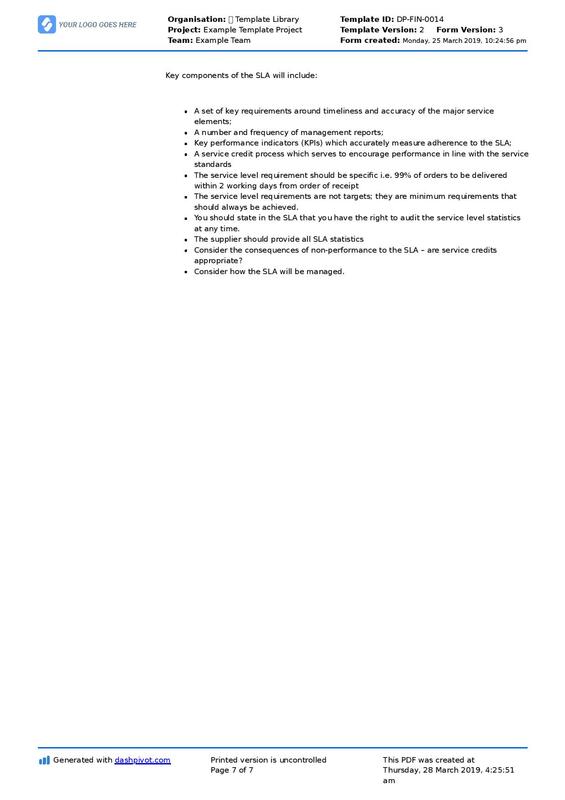 The truth about tender document for construction is that they could be better. They could be created better, managed better and shared in a more collaborative and professional manner. There are thousands of tender documents floating around construction companies and sites which are being manually completed and sent between parties. 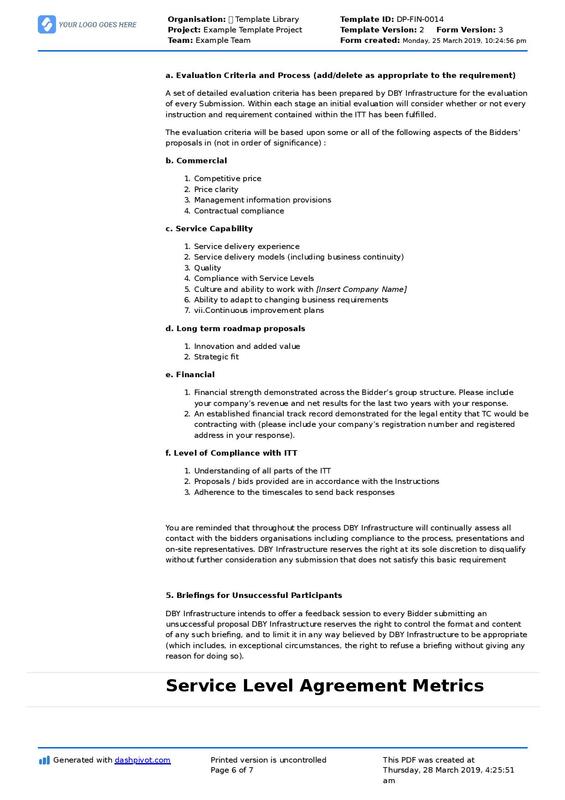 The process by which companies conduct the tendering the process can be drastically improved through more collaborative tender documents and tools - which you can look at below. Is there a better way of managing tender documents in the construction industry? Word and excel documents have been the go-to and easiest options for construction tender documents for many years, but today, there are digital options which enable you to manage tender documents more efficiently and professionally. 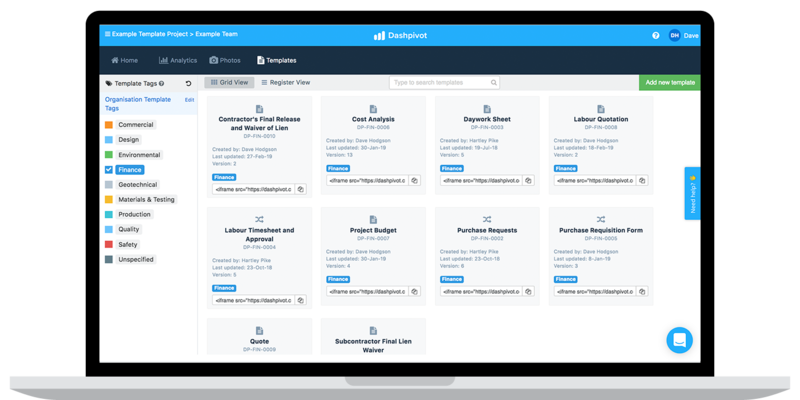 These systems, like the example of Dashpivot above, enable you to digitise and standardise your tender documents for construction. You can manage all of your tender documents from a single place, and access them, edit them, modify them, complete them, and share them as proper tender documents in PDF format. You can also take advantage of smart document fields and features like digital signoffs, which make the whole process so much friendlier for all parties involved and can set you apart from other vendors. Tender documents for construction are really important to your business, and they are also important for all project parties. The tendering process is one which happens thousands of times every day and dictates who works on what the ultimately the success of the project - and tender documents are at the heart of this process, enabling parties to effectively communicate and agree on who will deliver a project and what that delivery will look like and cost. 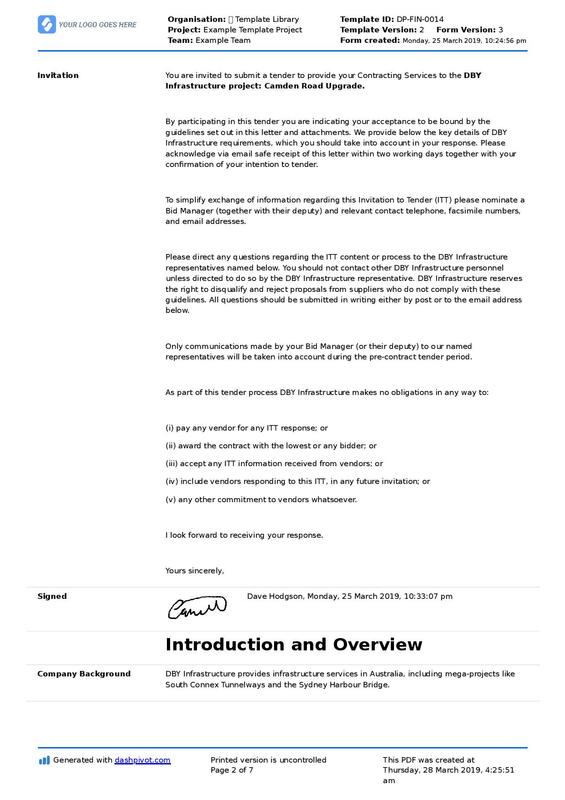 This invitation to tender template can be used to complete and send professional ITT documents to your preferred suppliers. Here's a building construction quotation sample and editable template you can use to make your building quotes more reliable and presentable. People in 80+ countries use this financial software to better capture, organise and track project finances. Sitemate software makes it easier for companies to win, deliver and manage projects - the smart way.